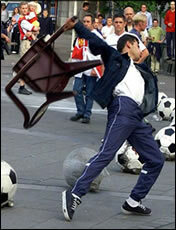 England has had more severe instances of football hooliganism than any other country in the world. The problem has also been associated with this country for the longest period of time too. Through the use of measures taken by the police, legislation by the government and rules set in place by the English Football Association, England has taken the lead in regulating and preventing the problem. Possibly the most successful yet controversial form of trying to prohibit the problem of football hooliganism is through the use of undercover operations. The first instances of undercover operations occurred in the mid-sixties when the FA recommended that plain-clothes officers be used in the domestic game. The FA also made requests in the early-eighties for the police to infiltrate gangs of football hooligans, with plain-clothes officers, when the hooligan groups became more structured. However, the problem with infiltrating football thugs in this way made it often difficult to obtain a conviction as the reliability of the evidence was often disputed. The natural progression the police made therefore was to give their officers new identities and dispositions and directed them to socialise and become part of these newly organised hooligan gangs. This enabled the undercover officers to see what acts of crime were taking place, whilst gathering evidence. This scheme was completed with a number of early morning raids on the members of the gang’s houses. This procedure was first used in March 1986 and was an instant success. With what they had said to the undercover officers and with what the police had found in their homes being used as the primary evidence against them, on most occasions, individuals arrested in these raids were charged with conspiracy to cause affray or conspiracy to commit violence. Although many of the raids on the hooligan’s property resulted in high-profile trials and convictions, the system was also strongly condemned. This was due to the reliability of evidence being intensely disputed and the behaviour of undercover officers being too violent, too serious and unnecessary. Throughout the seventies and eighties when football hooliganism was at its worst, uniformed police accompanied away supporters from railway stations and car parks to and from the ground. With some officers on horseback and others even being supported by police dogs, the police were again heavily criticised for dealing with the supporters in an extreme manner. At times useful processes (such as conducting searches on away coaches and supporters belongings) were found to be an invasion of privacy and an unnecessary intrusion. Partly due to the actions just mentioned but probably because of the better behaviour of away fans, the last decade, has seen the use of the less aggressive tactic of placing officers at specified locations on the way to the ground. There is also less of a need for the heavy-handed tactics of the seventies and eighties in today’s climate, as travelling away support has declined in the last ten years. Because of all-seater stadiums, rising ticket prices and the increasing rate of football matches being shown live on television throughout the week as well as weekends, the familiar mass arrival of football fans at train stations around the country on a Saturday has diminished over recent years. As technology has developed over the years, it has as a result played an important and crucial role in the policing against football hooliganism. Perhaps the most common and successful form of technology used at football grounds are CCTV cameras, used to catch instances of football hooliganism. Since the 1980s Closed-Circuit Television cameras have been placed both inside and outside grounds to monitor crowd trouble. Today CCTV is now used in and around almost every ground in Britain and in the larger stadiums there are police control rooms from which they can monitor the surrounding area for potential trouble. Another technological feature of police tactics at football grounds is the use of hand-held video cameras, with police filming supporters, primarily in a bid to deter violence, gather intelligence and monitor the effectiveness of crowd control. To take the use of technology a stage further, police officers have also used hand-held video cameras to record crowds entering and exiting stadiums to try and observe any person who may be acting suspiciously and to discourage any acts of violence. To supplement this, police officers are also frequently posted on turnstiles. With the main purpose is preventing illegal entry into the ground without a ticket and searching supporters for weapons, they have also been used by clubs to enforce club policy and ground regulations. Referred to as ‘spotters’, liaison officers have also been employed by clubs to monitor fans. The spotter system involves a liaison officer being attached to a particular club with their job to identify and monitor hooligans commuting to away games. The spotter will then pass on the information he has gathered to the police force associated with the club the supporter is travelling to, whether it be in the UK or abroad. As well as football clubs employing liaison officers inside their grounds to prevent violence, the number of steward has also increased. The nineties saw stewards being utilised to control fans inside grounds as opposed to police officers in the previous three decades. As a result the number of police officers present at football grounds today has dropped considerably. There is one significant distinction that differentiates a steward from a police officer. Police officers can only eject individuals from grounds if they are breaking the law, whereas stewards can follow a particular club’s agenda and eject people for breaking club and ground rules. However stewards often lack the ability in ejecting troublemakers and it is often left to a police officer to do so anyway. The European Union has a number of policies regarding sport and in particular football, with its strongest policy being on hooliganism. The EU defines hooliganism as ‘…having an anti social and violent minority of fans that spoil the enjoyment of the vast majority…’. The EU feels it should be playing a principal role in preventing hooliganism and has, as a result, adopted many of the initiatives pioneered in the UK. The impact of the Heysel Stadium tragedy in 1985 (where 39 Italian supporters were killed at the European Cup Final between Juventus and Liverpool) was such that three major European bodies addressed the issue of football violence. It was really only after this incident that a determined effort was made to establish cross-border co-operation in Europe between the two main football authorities; FIFA and UEFA. The Council of Europe drafted the ‘European Convention on Spectator Violence and misbehaviour at Sports Events and in Particular Football Matches’. Mainly as a response to the Heysal stadium disaster, its aims were to get organisations and authorities to work together to ensure safety and orderly conduct at sporting events. The convention suggested that measures should be taken to prevent and punish violent behaviour in sport through the co-ordination of police forces, governments and public agencies all over Europe. The convention also suggested the introduction of supporter clubs, the organisation of travel arrangements and the safer design of stadiums. The convention was the first way in which police co-operation between different European states over football hooliganism became common and is still considered today to be the appropriate framework for co-operation over hooliganism. Secondly, the European Council called on all member countries to deal with violence in and around sports stadium and, finally, The European Parliament proposed a number of different measures to combat football hooliganism.These guidelines included the prompt exchange of police intelligence information, the seizure of racist material intended for distribution abroad and the training of club stewards in crowd safety and control techniques. German, Belgian and Dutch authorities have all engaged in practical, hands on initiatives to reduce hooliganism. This is a very different approach used by the English who employ more mechanical strategies involving more rigorous policing of football fans (undercover operations), sophisticated surveillance (CCTV) and intelligence measures and new legislation. Nonetheless other European countries such as Italy have followed in the footsteps of the English by having a large police presence at certain game. Conversely the Italian police are a lot more intimidating and in some cases have been seen to overstep the mark. In some instances the Italian police have been armed with water cannons, tear gas and automatic weapons. However despite all of these brand new initiatives and advancement in technology and whilst football hooliganism appears to be on the decline in the UK, it can still be difficult for football hooligans to be caught. The main problem the police have is trying to differentiate a football hooligan from the average football supporter prior to any outbreaks of violence.